Friends can give you more lives to extend your game! Use Facebook, Friend Codes or Game center to connect. Move pastry to match 3 or more pastries. You can move them diagonally, too! Just tap on a star to find out how many points you need to earn it! If you earn enough points, you’ll also get a surprise gift! Each time you make a Special Match, you earn Coins! We can spend these Coins all throughout Sugar Sprinkles! Combine these Power-Ups to watch your score soar! Match 5 pastries to make the ultimate Power-Up! Match the Rainbow cake with a pastry to remove all pastries of that type from the board! Combine different Power-Ups and you'll become the sweetest baker in Sugar Sprinkles! Each chef takes turns matching pastries to win tiles. You can even take tiles owned by the other chef! Whoever captures the target number of tiles first wins! Making a match next to Chocolate Blockers removes them and earns you bonus points! To unlock new bakeries and regions, you’ll need stars! So always aim to complete a level with 3 stars by getting a high score! You can get free stuffs in Pastry Paradise app by logging in daily. You can get this cheat by changing your phone's time setting. Close your Pastry Paradise app by either restarting your phone or by killing it on your task manager. Open Pastry Paradise app and you will get your daily rewards. If you want to get instant daily rewards again, just complete the step 1-3. 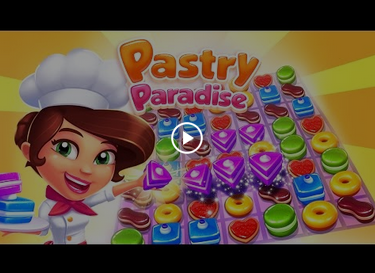 Open Pastry Paradise app but do not play a single game. Open Pastry Paradise app just to make sure that there is no problem.